One thinks of a museum as a permanent civic fixture, existing to preserve its rare treasures for eternity. But the organizers of the newly hatched Chicago Design Museum understand that contemporary media is ephemeral, ubiquitous, and alive in the world, so their museum will have a temporary physical existence, from June 1-30, in a Humboldt Park loft space. The CHIDM takes cues from the modern museum exhibition format, as its five curated exhibits present poster designs in clean, neat arrangements. To isolate designed works in this way, as purely visual artifacts, diminishes their functional roles and contexts. Where an exhibition at MoMA might explore design’s influence on the way we live, the CHIDM seeks to momentarily dissociate design as an applied art, and to herald the visual creativity of designers. Although it will host many events during this month’s AIGA annual Design Week, the CHIDM is poised to attract the attention of artists and others who routinely visit art museums. If artists don’t know the work of Ed Fella, now is the time to get acquainted with him. There are over fifty posters by this seventy-four-year-old legend, whose hand-drawn typography and abstract compositions recall the best experiments of Dada print media. Where clear and efficient communication is the dictum of classic design, Fella turns that on its head with his playful provocations. Fella soars as the inventor of a wonderfully strange visual universe. 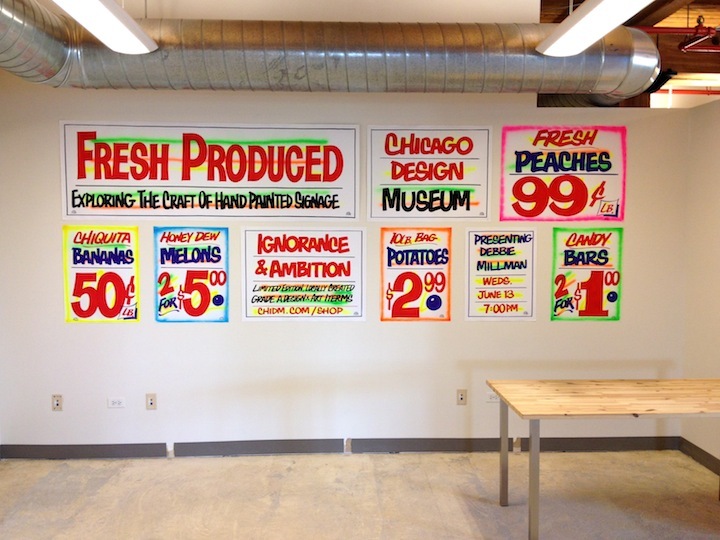 The best exhibit at the CHIDM is “Fresh Produced,” which looks at the humble hand-painted grocery-store-window advertisement. With bold, colorful lettering on white butcher paper, these signs are integral to the vernacular Chicago streetscape. But who makes them? The CHIDM is exhibiting the handcrafts of Le, of Le’s Signs, in the museum, alongside call-and-responses from local designers. During a CHIDM event, Le will be making made-to-order signs onsite. Rounding out the displays are a walk-through book by Debbie Millman, twenty smart homages to Russian Constructivist Alexander Rodchenko, a video-screening room, and an exhibit about IBM’s contributions to technology. This last exhibit, titled “IBM100: Icons of Progress,” might be better sited in IBM’s corporate lobby. Although the company has commissioned distinctive graphics over the years (notably, Paul Rand’s Eye-Bee-M pictogram), the exhibit serves to remind that commerce is the lifeblood of design. Like high-end consumer technology, design is most relevant not just when it solves a functional problem—it must also alter our behaviors as if that were the most natural act in the world. Art can do that, too, but in a more slow and reflective way. Whereas old design and technology are charming, what makes contemporary tech and design so urgent and attractive are their imminent obsolescence. The attitude that culture is a living but fleeting thing is implicit in the founding of a temporary design museum, but I don’t think a team of working designers would have it any other way. The Chicago Design Museum is the brainchild of Mark Dudlik and Tanner Woodford, and the non-profit Lost Creature, which established the Phoenix Design Museum. It is operated by a board of directors and a team of volunteers. After the CHIDM closes on June 30, its members will continue educational programming, such as lectures and screenings, in the city. The Chicago Design Museum is located at 700 North Sacramento, Suite 201.